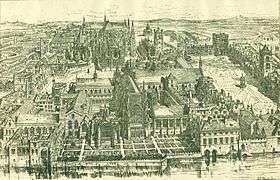 1Reflecting Parliament as it stood in 1707. The Parliament of England was the legislature of the Kingdom of England. In 1066, William of Normandy introduced what, in later centuries, became referred to as a feudal system, by which he sought the advice of a council of tenants-in-chief (a person who held land) and ecclesiastics before making laws. In 1215, the tenants-in-chief secured Magna Carta from King John, which established that the king may not levy or collect any taxes (except the feudal taxes to which they were hitherto accustomed), save with the consent of his royal council, which gradually developed into a parliament. Over the centuries, the English Parliament progressively limited the power of the English monarchy which arguably culminated in the English Civil War and the trial and execution of Charles I in 1649. After the restoration of the monarchy under Charles II, and the subsequent Glorious Revolution of 1688, the supremacy of Parliament was a settled principle and all future English and later British sovereigns were restricted to the role of constitutional monarchs with limited executive authority. The Act of Union 1707 merged the English Parliament with the Parliament of Scotland to form the Parliament of Great Britain. When the Parliament of Ireland was destroyed in 1801, its former members were merged into what was now called the Parliament of the United Kingdom. Under a monarchical system of government, monarchs usually must consult and seek a measure of acceptance for their policies if they are to enjoy the broad cooperation of their subjects. Early kings of England had no standing army or police, and so depended on the support of powerful subjects. The monarchy had agents in every part of the country. However, under the feudal system that evolved in England following the Norman Conquest of 1066, the laws of the Crown could not have been upheld without the support of the nobility and the clergy. The former had economic and military power bases of their own through major ownership of land and the feudal obligations of their tenants (some of whom held lands on condition of military service). The Church was virtually a law unto itself in this period as it had its own system of religious law courts. In order to seek consultation and consent from the nobility and the senior clergy on major decisions, post-Norman Conquest English monarchs called Great Councils. A typical Great Council would consist of archbishops, bishops, abbots, barons and earls, the pillars of the feudal system. When this system of consultation and consent broke down, it often became impossible for government to function effectively. The most prominent instances of this prior to the reign of Henry III are the disagreements between Thomas Becket and Henry II and between King John and the barons. Becket, who served as Archbishop of Canterbury between 1162 and 1170, was murdered following a long running dispute with Henry II over the jurisdiction of the Church. John, who was king from 1199 to 1216, aroused such hostility from many leading noblemen that they forced him to agree to Magna Carta in 1215. John's refusal to adhere to this charter led to civil war (see First Barons' War). The Great Council evolved into the Parliament of England. The term itself came into use during the early 13th century, deriving from the Latin and French words for discussion and speaking. The word first appears in official documents in the 1230s. As a result of the work by historians G. O. Sayles and H. G. Richardson, it is widely believed that the early parliaments had a judicial as well as a legislative function. During the 13th and 14th centuries, the kings began to call Knights of the Shire to meet when the monarch saw it as necessary. A notable example of this was in 1254 when sheriffs of counties were instructed to send Knights of the Shire to parliament to advise the king on finance. Initially, parliaments were mostly summoned when the king needed to raise money through taxes. Following the Magna Carta this became a convention. This was due in no small part to the fact that King John died in 1216 and was succeeded by his young son Henry III. Leading peers and clergy governed on Henry's behalf until he came of age, giving them a taste for power that they would prove unwilling to relinquish. Among other things, they made sure that Magna Carta would be reaffirmed by the young king. Once the minority of Henry III ended and he took full control of the government, leading peers became increasingly concerned with his style of government, specifically his unwillingness to consult them on decisions he took, and his seeming patronisation of his foreign relatives over his native subjects. Henry's support of a disastrous papal invasion of Sicily was the last straw. In 1258, seven leading barons forced Henry to swear to uphold the Provisions of Oxford, superseded, the following year, by the Provisions of Westminster. This effectively abolished the absolutist Anglo-Norman monarchy, giving power to a council of fifteen barons, and providing for a thrice-yearly meeting of parliament to monitor their performance. Parliament assembled six times between June 1258 and April 1262, most notably at Oxford in 1258. The French-born nobleman Simon de Montfort, Earl of Leicester, emerged as the leader of this characteristically English rebellion. In the following years, those supporting Montfort and those supporting the king grew more hostile to each other. Henry obtained a papal bull in 1263 exempting him from his oath and both sides began to raise armies. At the Battle of Lewes on 14 May 1264, Henry was defeated and taken prisoner by Montfort's army. However, many of the peers who had initially supported Montfort began to suspect that he had gone too far with his reforming zeal. His support amongst the nobility rapidly declined. So in 1264, Montfort summoned the first parliament in English history without any prior royal authorisation. The archbishops, bishops, abbots, earls and barons were summoned, as were two knights from each shire and two burgesses from each borough. Knights had been summoned to previous councils, but the representation of the boroughs was unprecedented. This was purely a move to consolidate Montfort's position as the legitimate governor of the kingdom, since he had captured Henry and his son Prince Edward (later Edward I) at the Battle of Lewes. A parliament consisting of representatives of the realm was the logical way for Montfort to establish his authority. In calling this parliament, in a bid to gain popular support, he summoned knights and burgesses from the emerging gentry class, thus turning to his advantage the fact that most of the nobility had abandoned his movement. This parliament was summoned on 14 December 1264. It first met on 20 January 1265 in Westminster Hall and was dissolved on 15 February 1265. It is not certain who actually attended this parliament. Nonetheless, Montfort's scheme was formally adopted by Edward I in the so-called "Model Parliament" of 1295. The attendance at parliament of knights and burgesses historically became known as the summoning of "the Commons", a term derived from the Norman French word "commune", literally translated as the "community of the realm". Following Edward's escape from captivity, Montfort was defeated and killed at the Battle of Evesham in 1265. Henry's authority was restored and the Provisions of Oxford were forgotten, but this was nonetheless a turning point in the history of the Parliament of England. Although he was not obliged by statute to do so, Henry summoned the Commons to parliament three times between September 1268 and April 1270. However, this was not a significant turning point in the history of parliamentary democracy. Subsequently, very little is known about how representatives were selected because, at this time, being sent to parliament was not a prestigious undertaking. But Montfort's decision to summon knights of the shires and burgesses to his parliament did mark the irreversible emergence of the landed gentry as a force in politics. From then on, monarchs could not ignore them, which explains Henry's decision to summon the Commons to several of his post-1265 parliaments. Even though many peers who had supported the Provisions of Oxford remained active in English public life throughout Henry's reign, the conditions they had laid down for regular parliaments were largely forgotten, as if to symbolise the historical development of the English Parliament via convention rather than statutes and written constitutions. During the reign of Edward I, which began in 1272, the role of Parliament in the government of the English kingdom increased due to Edward's determination to unite England, Wales and Scotland under his rule by force. He was also keen to unite his subjects in order to restore his authority and not face rebellion as was his father's fate. Edward therefore encouraged all sectors of society to submit petitions to parliament detailing their grievances in order for them to be resolved. This seemingly gave all of Edward's subjects a potential role in government and this helped Edward assert his authority. Both the Statute of Westminster 1275 and Statute of Westminster 1285, with the assistance of Robert Burnell, codified the existing law in England. As the number of petitions being submitted to parliament increased, they came to be dealt with, and often ignored, more and more by ministers of the Crown so as not to block the passage of government business through parliament. However the emergence of petitioning is significant because it is some of the earliest evidence of parliament being used as a forum to address the general grievances of ordinary people. Submitting a petition to parliament is a tradition that continues to this day in the Parliament of the United Kingdom and in most Commonwealth realms. These developments symbolise the fact that parliament and government were by no means the same thing by this point. If monarchs were going to impose their will on their kingdom, they would have to control parliament rather than be subservient to it. From Edward's reign onwards, the authority of the English Parliament would depend on the strength or weakness of the incumbent monarch. When the king or queen was strong he or she would wield enough influence to pass their legislation through parliament without much trouble. Some strong monarchs even bypassed it completely, although this was not often possible in the case of financial legislation due to the post-Magna Carta convention of parliament granting taxes. When weak monarchs governed, parliament often became the centre of opposition against them. Subsequently, the composition of parliaments in this period varied depending on the decisions that needed to be taken in them. The nobility and senior clergy were always summoned. From 1265 onwards, when the monarch needed to raise money through taxes, it was usual for knights and burgesses to be summoned too. However, when the king was merely seeking advice, he often only summoned the nobility and the clergy, sometimes with and sometimes without the knights of the shires. On some occasions the Commons were summoned and sent home again once the monarch was finished with them, allowing parliament to continue without them. It was not until the mid-14th century that summoning representatives of the shires and the boroughs became the norm for all parliaments. One of the moments that marked the emergence of parliament as a true institution in England was the deposition of Edward II. Even though it is debatable whether Edward II was deposed in parliament or by parliament, this remarkable sequence of events consolidated the importance of parliament in the English unwritten constitution. Parliament was also crucial in establishing the legitimacy of the king who replaced Edward II: his son Edward III. In 1341 the Commons met separately from the nobility and clergy for the first time, creating what was effectively an Upper Chamber and a Lower Chamber, with the knights and burgesses sitting in the latter. This Upper Chamber became known as the House of Lords from 1544 onward, and the Lower Chamber became known as the House of Commons, collectively known as the Houses of Parliament. The authority of parliament grew under Edward III; it was established that no law could be made, nor any tax levied, without the consent of both Houses and the Sovereign. This development occurred during the reign of Edward III because he was involved in the Hundred Years' War and needed finances. During his conduct of the war, Edward tried to circumvent parliament as much as possible, which caused this edict to be passed. The Commons came to act with increasing boldness during this period. During the Good Parliament (1376), the Presiding Officer of the lower chamber, Sir Peter de la Mare, complained of heavy taxes, demanded an accounting of the royal expenditures, and criticised the king's management of the military. The Commons even proceeded to impeach some of the king's ministers. The bold Speaker was imprisoned, but was soon released after the death of Edward III. During the reign of the next monarch, Richard II, the Commons once again began to impeach errant ministers of the Crown. They insisted that they could not only control taxation, but also public expenditure. Despite such gains in authority, however, the Commons still remained much less powerful than the House of Lords and the Crown. This period also saw the introduction of a franchise which limited the number of people who could vote in elections for the House of Commons. From 1430 onwards, the franchise was limited to Forty Shilling Freeholders, that is men who owned freehold property worth forty shillings or more. The Parliament of England legislated the new uniform county franchise, in the statute 8 Hen. 6, c. 7. The Chronological Table of the Statutes does not mention such a 1430 law, as it was included in the Consolidated Statutes as a recital in the Electors of Knights of the Shire Act 1432 (10 Hen. 6, c. 2), which amended and re-enacted the 1430 law to make clear that the resident of a county had to have a forty shilling freehold in that county to be a voter there. It was during the reign of the Tudor monarchs that the modern structure of the English Parliament began to be created. The Tudor monarchy was powerful and there were often periods of several years when parliament did not sit at all. However the Tudor monarchs were astute enough to realise that they needed parliament to legitimise many of their decisions, mostly out of a need to raise money through taxation legitimately without causing discontent. Thus they consolidated the state of affairs whereby monarchs would call and close parliament as and when they needed it. By the time Henry Tudor (Henry VII) came to the throne in 1485 the monarch was not a member of either the Upper Chamber or the Lower Chamber. Consequently, the monarch would have to make his or her feelings known to Parliament through his or her supporters in both houses. Proceedings were regulated by the presiding officer in either chamber. From the 1540s the presiding officer in the House of Commons became formally known as the "Speaker", having previously been referred to as the "prolocutor" or "parlour" (a semi-official position, often nominated by the monarch, that had existed ever since Peter de Montfort had acted as the presiding officer of the Oxford Parliament of 1258). This was not an enviable job. When the House of Commons was unhappy it was the Speaker who had to deliver this news to the monarch. This began the tradition whereby the Speaker of the House of Commons is dragged to the Speaker's Chair by other members once elected. A member of either chamber could present a "bill" to parliament. Bills supported by the monarch were often proposed by members of the Privy Council who sat in parliament. In order for a bill to become law it would have to be approved by a majority of both Houses of Parliament before it passed to the monarch for royal assent or veto. The royal veto was applied several times during the 16th and 17th centuries and it is still the right of the monarch of the United Kingdom and Commonwealth realms to veto legislation today, although it has not been exercised since 1707 (today such exercise would presumably precipitate a constitutional crisis). When a bill was enacted into law, this process gave it the approval of each estate of the realm: the King, Lords, and Commons. In reality, this was not a democratic process. The Parliament of England was far from being a democratically representative institution in this period. It was possible to assemble the entire peerage and senior clergy of the realm in one place to form the estate of the Upper Chamber. However, the voting franchise for the House of Commons was small; some historians estimate that it was as little as three per cent of the adult male population; and there was no secret ballot. This meant that elections could be controlled by local grandees, because in many boroughs a majority of voters were in some way dependent on a powerful individual, or else could be bought by money or concessions. If these grandees were supporters of the incumbent monarch, this gave the Crown and its ministers considerable influence over the business of parliament. Many of the men elected to parliament did not relish the prospect of having to act in the interests of others. So a law was enacted, still on the statute book today, whereby it became unlawful for members of the House of Commons to resign their seat unless they were granted a position directly within the patronage of the monarchy (today this latter restriction leads to a legal fiction allowing de facto resignation despite the prohibition, but nevertheless it is a resignation which needs the permission of the Crown). However, it must be emphasised that while several elections to parliament in this period were in some way corrupt by modern standards, many elections involved genuine contests between rival candidates, even though the ballot was not secret. It was in this period that the Palace of Westminster was established as the seat of the English Parliament. In 1548, the House of Commons was granted a regular meeting place by the Crown, St Stephen's Chapel. This had been a royal chapel. It was made into a debating chamber after Henry VIII became the last monarch to use the Palace of Westminster as a place of residence and following the suppression of the college there. This room became the home of the House of Commons until it was destroyed by fire in 1834, although the interior was altered several times up until then. The structure of this room was pivotal in the development of the Parliament of England. While most modern legislatures sit in a circular chamber, the benches of the British Houses of Parliament are laid out in the form of choir stalls in a chapel, simply because this is the part of the original room that the members of the House of Commons utilised when they were granted use of St Stephen's Chapel. This structure took on a new significance with the emergence of political parties in the late 17th and early 18th centuries, as the tradition began whereby the members of the governing party would sit on the benches to the right of the Speaker and the opposition members on the benches to the left. It is said that the Speaker's chair was placed in front of the chapel's altar. As Members came and went they observed the custom of bowing to the altar and continued to do so, even when it had been taken away, thus then bowing to the Chair, as is still the custom today. The numbers of the Lords Spiritual diminished under Henry VIII, who commanded the Dissolution of the Monasteries, thereby depriving the abbots and priors of their seats in the Upper House. For the first time, the Lords Temporal were more numerous than the Lords Spiritual. Currently, the Lords Spiritual consist of the Archbishops of Canterbury and York, the Bishops of London, Durham and Winchester, and twenty-one other English diocesan bishops in seniority of appointment to a diocese. 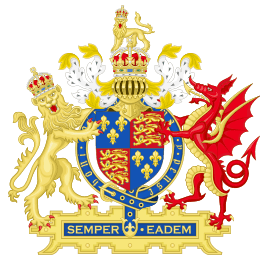 The Laws in Wales Acts of 1535–42 annexed Wales as part of England and this brought Welsh representatives into the Parliament of England, first elected in 1542. Parliament had not always submitted to the wishes of the Tudor monarchs. But parliamentary criticism of the monarchy reached new levels in the 17th century. When the last Tudor monarch, Elizabeth I, died in 1603, King James VI of Scotland came to power as King James I, founding the Stuart monarchy. In 1628, alarmed by the arbitrary exercise of royal power, the House of Commons submitted to Charles I the Petition of Right, demanding the restoration of their liberties. Though he accepted the petition, Charles later dissolved parliament and ruled without them for eleven years. It was only after the financial disaster of the Scottish Bishops' Wars (1639–1640) that he was forced to recall Parliament so that they could authorise new taxes. This resulted in the calling of the assemblies known historically as the Short Parliament of 1640 and the Long Parliament, which sat with several breaks and in various forms between 1640 and 1660. The Long Parliament was characterised by the growing number of critics of the king who sat in it. The most prominent of these critics in the House of Commons was John Pym. Tensions between the king and his parliament reached boiling point in January 1642 when Charles entered the House of Commons and tried, unsuccessfully, to arrest Pym and four other members for their alleged treason. The five members had been tipped off about this, and by the time Charles came into the chamber with a group of soldiers they had disappeared. Charles was further humiliated when he asked the Speaker, William Lenthall, to give their whereabouts, which Lenthall famously refused to do. From then on relations between the king and his parliament deteriorated further. When trouble started to brew in Ireland, both Charles and his parliament raised armies to quell the uprisings by native Catholics there. It was not long before it was clear that these forces would end up fighting each other, leading to the English Civil War which began with the Battle of Edgehill in October 1642: those supporting the cause of parliament were called Parliamentarians (or Roundheads). Battles between Crown and Parliament would continue throughout the 17th and 18th centuries, but parliament was no longer subservient to the English monarchy. This change was symbolised in the execution of Charles I in January 1649. It is somewhat ironic that this event was not instigated by the elected representatives of the realm. In Pride's Purge of December 1648, the New Model Army (which by then had emerged as the leading force in the parliamentary alliance) purged Parliament of members that did not support them. The remaining "Rump Parliament", as it was later referred to by critics, enacted legislation to put the king on trial for treason. This trial, the outcome of which was a foregone conclusion, led to the execution of the king and the start of an 11 year republic. The House of Lords was abolished and the purged House of Commons governed England until April 1653, when army chief Oliver Cromwell dissolved it following disagreements over religious policy and how to carry out elections to parliament. Cromwell later convened a parliament of religious radicals in 1653, commonly known as Barebone's Parliament, followed by the unicameral First Protectorate Parliament that sat from September 1654 to January 1655 and the Second Protectorate Parliament that sat in two sessions between 1656 and 1658, the first session was unicameral and the second session was bicameral. Although it is easy to dismiss the English Republic of 1649-60 as nothing more than a Cromwellian military dictatorship, the events that took place in this decade were hugely important in determining the future of parliament. First, it was during the sitting of the first Rump Parliament that members of the House of Commons became known as "MPs" (Members of Parliament). Second, Cromwell gave a huge degree of freedom to his parliaments, although royalists were barred from sitting in all but a handful of cases. His vision of parliament appears to have been largely based on the example of the Elizabethan parliaments. However, he underestimated the extent to which Elizabeth I and her ministers had directly and indirectly influenced the decision-making process of her parliaments. He was thus always surprised when they became troublesome. He ended up dissolving each parliament that he convened. Yet it is worth noting that the structure of the second session of the Second Protectorate Parliament of 1658 was almost identical to the parliamentary structure consolidated in the Glorious Revolution Settlement of 1689. In 1653 Cromwell had been made head of state with the title Lord Protector of the Realm. The Second Protectorate Parliament offered him the crown. Cromwell rejected this offer, but the governmental structure embodied in the final version of the Humble Petition and Advice was a basis for all future parliaments. It proposed an elected House of Commons as the Lower Chamber, a House of Lords containing peers of the realm as the Upper Chamber, and a constitutional monarchy, subservient to parliament and the laws of the nation, as the executive arm of the state at the top of the tree, assisted in carrying out their duties by a Privy Council. Oliver Cromwell had thus inadvertently presided over the creation of a basis for the future parliamentary government of England. In 1657 he had the Parliament of Scotland unified with the English Parliament. In terms of the evolution of parliament as an institution, by far the most important development during the republic was the sitting of the Rump Parliament between 1649 and 1653. This proved that parliament could survive without a monarchy and a House of Lords if it wanted to. Future English monarchs would never forget this. Charles I was the last English monarch ever to enter the House of Commons. Even to this day, a Member of the Parliament of the United Kingdom is sent to Buckingham Palace as a ceremonial hostage during the State Opening of Parliament, in order to ensure the safe return of the sovereign from a potentially hostile parliament. During the ceremony the monarch sits on the throne in the House of Lords and signals for the Lord Great Chamberlain to summon the House of Commons to the Lords Chamber. The Lord Great Chamberlain then raises his wand of office to signal to the Gentleman Usher of the Black Rod, who has been waiting in the central lobby. Black Rod turns and, escorted by the doorkeeper of the House of Lords and an inspector of police, approaches the doors to the chamber of the Commons. The doors are slammed in his face – symbolising the right of the Commons to debate without the presence of the Queen's representative. He then strikes three times with his staff (the Black Rod), and he is admitted. The revolutionary events that occurred between 1620 and 1689 all took place in the name of parliament. The new status of parliament as the central governmental organ of the English state was consolidated during the events surrounding the Restoration of the monarchy in 1660. Following the death of Oliver Cromwell in September 1658, his son Richard Cromwell succeeded him as Lord Protector, summoning the Third Protectorate Parliament in the process. When this parliament was dissolved following pressure from the army in April 1659, the Rump Parliament was recalled at the insistence of the surviving army grandees. This in turn was dissolved in a coup led by army general John Lambert, leading to the formation of the Committee of Safety, dominated by Lambert and his supporters. When the breakaway forces of George Monck invaded England from Scotland where they had been stationed—without Lambert's supporters putting up a fight—Monck temporarily recalled the Rump Parliament and reversed Pride's Purge by recalling the entirety of the Long Parliament. They then voted to dissolve themselves and call new elections, which were arguably the most democratic for 20 years although the franchise was still very small. This led to the calling of the Convention Parliament which was dominated by royalists. This parliament voted to reinstate the monarchy and the House of Lords. Charles II returned to England as king in May 1660. The Anglo-Scottish parliamentary union that Cromwell had established was dissolved in 1661 when the Scottish Parliament resumed its separate meeting place in Edinburgh. The Restoration began the tradition whereby all governments looked to parliament for legitimacy. In 1681 Charles II dissolved parliament and ruled without them for the last four years of his reign. This followed bitter disagreements between the king and parliament that had occurred between 1679 and 1681. Charles took a big gamble by doing this. He risked the possibility of a military showdown akin to that of 1642. However he rightly predicted that the nation did not want another civil war. Parliament disbanded without a fight. Events that followed ensured that this would be nothing but a temporary blip. Charles II died in 1685 and he was succeeded by his brother James II. During his lifetime Charles had always pledged loyalty to the Protestant Church of England, despite his private Catholic sympathies. James was openly Catholic. He attempted to lift restrictions on Catholics taking up public offices. This was bitterly opposed by Protestants in his kingdom. They invited William of Orange, a Protestant who had married Mary, daughter of James II and Anne Hyde to invade England and claim the throne. William assembled an army estimated at 15,000 soldiers (11,000 foot and 4000 horse) and landed at Brixham in southwest England in November, 1688. When many Protestant officers, including James's close adviser, John Churchill, 1st Duke of Marlborough, defected from the English army to William's invasion force, James fled the country. Parliament then offered the Crown to his Protestant daughter Mary, instead of his son (James Francis Edward Stuart). Mary refused the offer, and instead William and Mary ruled jointly, with both having the right to rule alone on the other's death. As part of the compromise in allowing William to be King—called the Glorious Revolution—Parliament was able to have the 1689 Bill of Rights enacted. Later the 1701 Act of Settlement was approved. These were statutes that lawfully upheld the prominence of parliament for the first time in English history. These events marked the beginning of the English constitutional monarchy and its role as one of the three elements of parliament. Following the Treaty of Union in 1707, Acts of Parliament passed in the Parliament of England and the Parliament of Scotland created a new Kingdom of Great Britain and dissolved both parliaments, replacing them with a new Parliament of Great Britain based in the former home of the English parliament. The Parliament of Great Britain later became the Parliament of the United Kingdom in 1801 when the United Kingdom of Great Britain and Ireland was formed through the Act of Union 1800. Calais, between 1372 and 1558. Blackstone, Sir William. (1765). Commentaries on the Laws of England. Oxford: Clarendon Press. Davies, M. (2003). Companion to the Standing Orders and guide to the Proceedings of the House of Lords, 19th ed. Maddicott, John. The Origins of the English Parliament, 924-1327. Oxford: Oxford University Press; 2010. ISBN 0-19-958550-4. "Parliament." (1911). Encyclopædia Britannica, 11th ed. London: Cambridge University Press. Wikimedia Commons has media related to Parliament of England.